Human detritus that clutters the state's beaches each year — soda caps, potato chip wrappers, plastic bags — will get a new home this Saturday during the California Coastal Commission's annual beach cleanup. The state agency, and an army of citizen volunteers, will collect tons of litter and send it to landfills and recycling centers according to Eben Schwartz, Marine Debris Program Manager for the Coastal Commission. 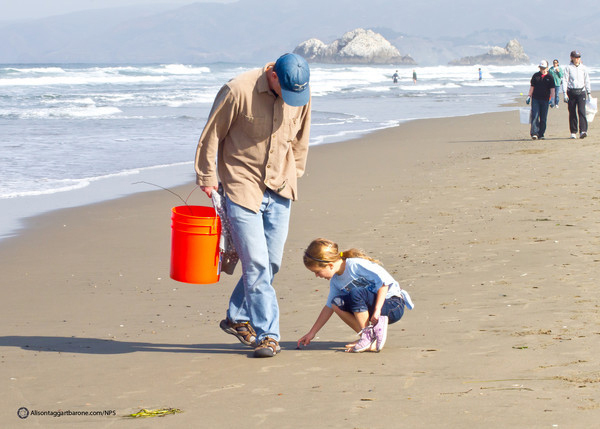 What: California Coastal Cleanup Day. Where: 900+ locations. Check this map for details. When: Saturday September 17, 9 a.m. to 12 p.m. (at most locations). How: Show up on Saturday in comfortable clothes and closed-toed shoes (a hat and sunscreen are recommended). Trash collection supplies provided but bringing reusable items -- like a bucket or reusable bag and gardening gloves -- is encouraged as they cut down on single-use bags. "It's an enormous amount of debris that we’re pulling out," says Schwartz. Last year volunteers gathered more than 1.1 million pounds of trash and recyclables. The waste isn't just unsightly, Schwartz says, it's also dangerous to marine animals that can consume small fragments or become entangled in larger debris. "It's incredibly hazardous in a number of ways," says Schwartz. "Wildlife ingest it and it can block their esophagus and keep them from eating or they can have a false sense of being full." This can lead to starvation, even though the animals' stomachs are full -- often with plastic trash. More than 18 billion pounds of plastic enter the world’s oceans every year. This Saturday, the Commission is focusing on cigarette butts, the number one item it collects each year. "If we were to fix our cigarette litter problem, we would halve the amount of material we pick up each year," says Schwartz. He also says cigarette filters don't biodegrade and the chemicals in cigarettes can leach into the water. Of the 4,000 chemicals created when a cigarette is smoked, 43 are known carcinogens. "Imagine what happens when our dogs or children pick these up and ingest them -- it can be really damaging." If you want to participate this year, but don't live near the beach, not to worry. Cleanups also take place on roadsides, highways, parks, rivers, creeks and bays. For more information check online or call (800) COAST-4U.